At Madrid Río, a playground. MADRID — The boy is on a tire swing asking for another push. The girl is sitting on a granite wall, reading “Twilight” for the umpteenth time. We are playing under a highway ramp on the Manzanares River, a spot that’s become our favorite hangout in the Spanish capital. Yes, in many cities, this place would usually play host to a soiled sleeping bag and a shopping cart. But here, I see this: My plate of olives and a cold Heineken on a cafe table, a 55,000-seat soccer stadium, bikers, joggers, elderly strollers, and face-sucking teens gathering to celebrate the greatest urban park on earth. How great? Great enough that not only will I tolerate the Toto song “Africa” playing over the cafe’s speakers — a song I’ve despised since approximately May 10, 1982 — but also I’ve sent myself a text reminder to download it before the next morning’s run. Forgive me, landscape design majors. I’m sure I’m overlooking some other special urban nirvana. 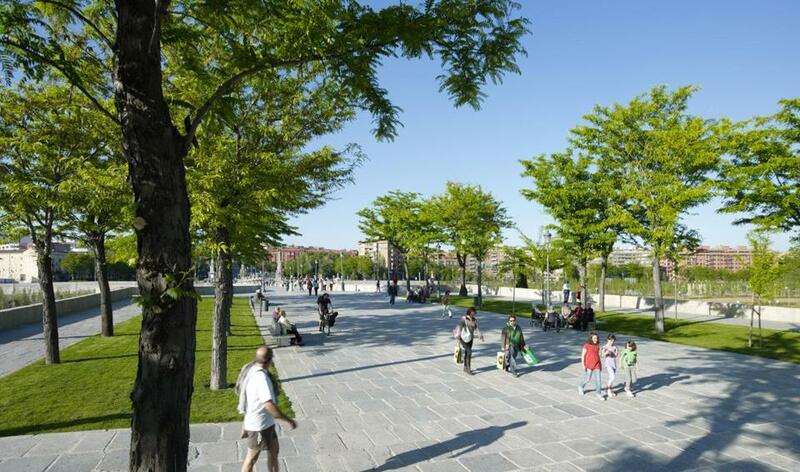 Maybe the Madrid Río, the park running along the Manzanares, doesn’t measure up against Seoul’s Cheonggye-cheon space or New York’s High Line. For me, it’s been a grand discovery. I arrived in Madrid expecting to make daily pilgrimages to the Prado, to the jamon vendor at the San Miguel market, and Retiro Park. Instead, I’ve punctuated most evenings with visits by this river. Truth is, this river is not unknown to the locals. The place is packed. And with good reason. Take the playgrounds. Every few minutes along this 6½-mile path, you find a small section of play-space heaven. We’re not talking about a seesaw and row of swings. The Río has a ropes course, skate park, and bike ramps. Tube slides wind in and out of a small hill. Musical blocks wait for you to jump on them, creating your own song. It’s that FAO Schwarz scene from “Big” and the Museum of Science’s staircase rolled into one, only free. Well, maybe not for Spaniards. The eight-year project, completed in 2011, came at a cost. Miles of roadways were sunk to clear out the surface. Pedestrian bridges were built, tons of stone installed, tens of thousands of new trees planted. By the end, the project price tag rose to $5 billion. I can live with that. After all, those aren’t my churros. I’m just an American enjoying Madrid’s fine work. And I’m not the only one. Michael Slichenmyer, an Illinois transplant who moved to the city in 2002, told me the park helped people rediscover a place that most people took for granted. “For me, it’s become a wonderful little oasis in the middle of all the aridness,” he said. Speaking of oasis, there’s the Madrid “beach.” There’s no sand, no waves, and no lifeguards. Instead, three oval-shaped sections of stonework feature water jets that shoot into the air. They fire off at random moments, sometimes higher, sometimes lower. On one of the days we were there, Cal, 4, ran through, cooling off and trying to catch the spray. Lila, 12, dipped in as well, trying not to get too wet. Parents held babies on the edges, older kids and teenagers darted around the circle, and a man who looked like a cross between Neil Diamond and Julio Iglesias strolled in to watch the action. Me? I gathered up the kids so we could head to our personal favorite spot, Columpios. That’s the Spanish word for swings and this place, under the concrete overpass, became our way to end each evening. Blue flowers, granite slabs, and shrubs dot the landscape. The support columns have been painted black. AtléticoMadrid’s home, Estadio Vicente Calderón, can be seen to the left, bathed in Saturday evening sun. 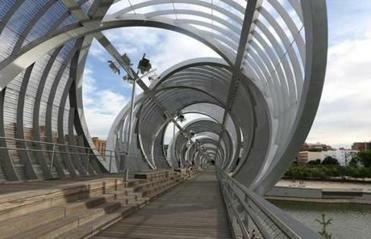 To the right, a French architect built a stunning, metal pedestrian bridge. Sure, New York Times critic Michael Kimmelman slammed its “incongruous” spiral design, but he’s an expert. I just liked the way it looked. At Columpois, the kids play. I would order myself a beer (pequeno) and the kids a cheese pizza (Cal) and a hot dog (Lila). Not everything is fun and play. I am an adult and felt some responsibility to expose the children to the beauty and majesty of Madrid’s cultural wealth. So on our last day, I crouched in front of Picasso’s “Guernica ” at the Museo Reina Sofía, pointing out each tormented figure to Cal, before heading back to San Miguel and fried sardines and my umpteenth café con leche. Then we went to the park. Maybe my moment of travel bliss should have come from something more than pushing my boy on a swing as “Hotel California” played. Maybe not. Whatever the case, this, to me, was the only way to end our trip.